2. The policy consists of source files used to generate the SELinux kernel policy file, a file_contexts configuration, a property_contexts configuration, a seapp_contexts configuration, and a mac_permissions.xml configuration. The file_contexts configuration is used to label files at build time (e.g. the system partition) and at runtime (e.g. device nodes, service socket files, /data directories created by init.rc, ...). The file_contexts configuration content of AOSP and SEforAndroid are a little different. It will be used by external/libselinux/src/android.c and external/libsepol/src/module.c. The property_contexts configuration is used to specify the security context of Android properties for permission checking purposes. The property_contexts configuration content of AOSP and SEforAndroid are a little different. It will be used by system/core/init/init.c and frameworks/base/services/java/com/android/server/DevicePolicyManagerService.java. The seapp_contexts configuration is used to label app processes and app package directories. The seapp_contexts configuration content of AOSP and SEforAndroid are a little different. It is used by external/libselinux/src/android.c and frameworks/base/services/java/com/android/server/DevicePolicyManagerService.java. The mac_permissions.xml configuration is the middleware MAC policy. The mac_permissions.xml configuration content of AOSP and SEforAndroid are a little different. It is used by frameworks/base/services/java/com/android/server/DevicePolicyManagerService.java, external/sepolicy/tools/setool/src/com/seandroid/tools/PolicyParser.java, frameworks/base/services/java/com/android/server/pm/SELinuxMMAC.java and some *.py files. The property_contexts, seapp_contexts, and mac_permissions.xml configurations are unique to SE for Android (i.e. they were not part of the regular SELinux policy). 3.Device-specific policy can be specified by defining BOARD_SEPOLICY_DIRS, BOARD_SEPOLICY_UNION and/or BOARD_SEPOLICY_REPLACE, BOARD_SEPOLICY_IGNORE variables in a BoardConfig.mk file under the device/<vendor>/<device> or vendor/<vendor>/<device> directories. BOARD_SEPOLICY_UNION is a list of files that will be "unioned", IE concatenated, at the END of their respective file in external/sepolicy. Note, to add a unique file you would use this variable. BOARD_SEPOLICY_REPLACE is a list of files that will be used instead of the corresponding file in external/sepolicy. BOARD_SEPOLICY_DIRS contains a list of directories to search for BOARD_SEPOLICY_UNION and BOARD_SEPOLICY_REPLACE files. Order matters in this list. BOARD_SEPOLICY_IGNORE is a list of paths (directory + filename) of files that are not to be included in the resulting policy. This list is passed to filter-out to remove any paths you may want to ignore. This is useful if you have numerous config directories that contain a file and you want to NOT include a particular file in your resulting policy file, either by UNION or REPLACE. 4. SELinux kernel policy is presently compiled as part of the Android build and added to the ramdisk image so that it can be loaded by init very early in boot, before mounting the system partition. 5.Once the data partition has been mounted, policy can be reloaded from /data/security by placing policy files under /data/security and setting the selinux.reload_policy property to 1 (setprop selinux.reload_policy 1). This will trigger a reload of policy by init, which will also restart ueventd and installd so that they can reload the policy configuration files relevant to their operation. 6.The initialisation or policy reload process will always check for a policy at /data/security/sepolicy first and then if not present at /sepolicy. 8. The *.te files are the policy module definition files. These are the same format as the standard reference policy and are expanded by the m4 macros. There is (generally) one .te file for each domain/service defined for the device and will contain all the required allow, type_transition etc. rules. It will also call any te_macros to access other domains resources (e.g. init_daemon_domain, binder_call). selinux_android_setcontext - Computes process security contexts.selinux_android_setfilecon2 - Computes file/directory security contexts. selinux_android_seapp_context_reload will also reload this file. isSystemServer=true can only be used once. An unspecified isSystemServer defaults to false. An unspecified string selector will match any value. A user string selector that ends in * will perform a prefix match. user=app_* will match any regular app UID. user=isolated will match any isolated service UID. All specified input selectors in an entry must match (i.e. logical AND). 2) Specified user= string before unspecified user= string. 3) Fixed user= string before user= prefix (i.e. ending in *). 4) Longer user= prefix before shorter user= prefix. 5) Specified seinfo= string before unspecified seinfo= string. 6) Specified name= string before unspecified name= string. 7) Specified sebool= string before unspecified sebool= string. domain (string) - The type component of a process context. From (string; one of none, all, app, or user) - A level that will be automatically computed based on the parameter. Only entries that specify domain= will be used for app process labeling. Only entries that specify type= will be used for app directory labeling. levelFrom=user is only supported for _app or _isolated UIDs. levelFrom=app or levelFrom=all is only supported for _app UIDs. level may be used to specify a fixed level for any UID. 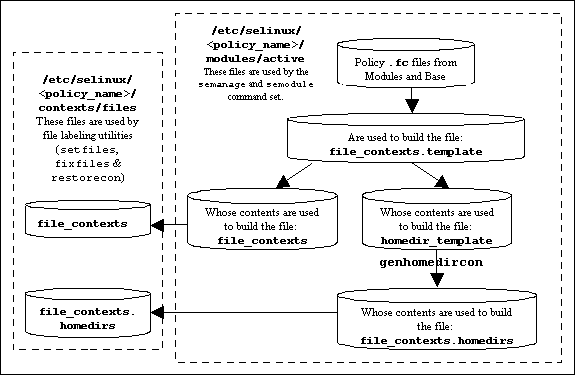 This file becomes the policies ./contexts/files/file_contexts file and is built from entries in the ./modules/active/file_contexts.template file as explained above and shown in above picture. It is then used by the file labeling utilities to ensure that files and directories are labeled according to the policy. 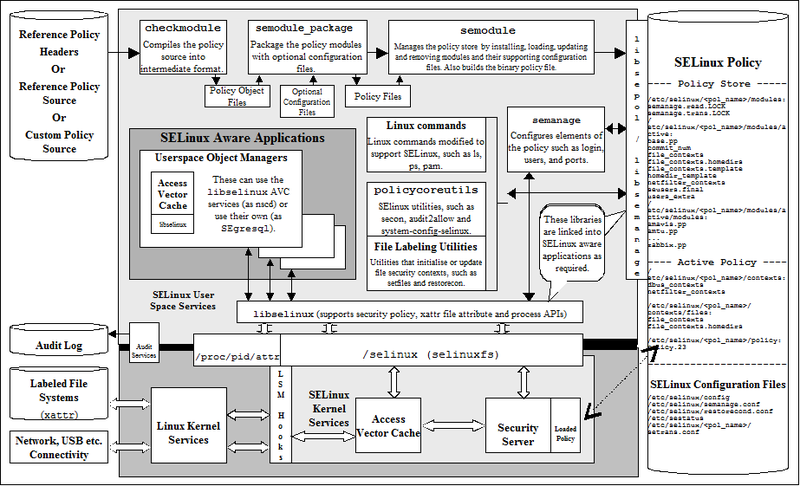 This file holds property names and their contexts that will be applied by SELinux when applications are loaded. The property names reflect the 'white list' of Android property entries that are also built into the system (see system/core/init/property_service.c and init.c) however there are also additional property entries for applications that require specific contexts to be set. property_key The key used to obtain the context that may contain '*' for wildcard matching. context The security context that will be applied to the object. checkseapp - Used to parse the seapp_contexts file against the binary policy sepolicy. This is to ensure policy related information is valid (e.g. checks booleans, types, levels etc.). insertkeys.py - Used to replace keywords in the signature sections of the mac_permissions.xml and mmac_types.xml files with keys obtained frompem files. This uses information contained in the external/sepolicy/keys.conf file that is detailed in the keys.conf section. This utility will also strip files of comments. setool - This is not used by the actual build process but assists in generating new entries for the mac_permissions.xml file. It will extract permissions from one or more packages with their signatures then generate the package sections. Its output may need to be modified before inclusion in the master file as detailed in the setool section. 1. This mechanism applies an install-time check of app permissions against a MAC policy configuration (found in external/sepolicy/mac_permissions.xml in the source tree and as /system/etc/security/mac_permissions.xml on the system image). 3. The persist.mmac.enforce system property controls whether the MAC restrictions are enforced; this can be set via SEAdmin app or via setprop. 4. The setool program can be used to generate policy stanzas for mac_permissions.xml, or to check whether a given apk would violate a given mac_permissions.xml configuration. 5. Install-time MMAC policy that checks whether app permissions are allowed or not. If not allowed, the app cannot be installed or if the app is already installed before the updated policy, then the app cannot be run after the update. 1. A revoked permission list is maintained for each package and checked at runtime on permission checks. 2. A revoked permissions configuration (found in external/mac-policy/revoke_permissions.xml in the source tree and as etc/security/revoke_permissions.xml on the system image) can specify revocation lists that are applied automatically on each boot. 3. Revoke permissions policy that checks whether the policy configured permissions on a package basis will be revoked at run time. If not allowed, that permission will be revoked (i.e. allow all unless specifically revoked). This is an optional policy and does not require any specific SELinux policy support. 1. Intent MAC supports a white-list of Intents and the types of their sources and destinations. 2. Currently, we only protect delivery of Intents to Activities, Broadcast Receivers, and Services. Content Providers are not yet protected. 3. Intent MMAC policy that checks whether the policy configured app intents (on a package and/or signature basis) are allowed or not at run time. If not allowed, that intent will not be sent. Kernel auditing is included by default when building the SE for Android supplied kernels (e.g. for goldfish kernel see thekernel/goldfish/arch/arm/configs/goldfish_arm7_defconfig file) and auditd daemon is also included by default (seebuild/target/product/core.mk - under the SELinux packages). The audit daemon output is formatted so that ausearch(8) can be used to search for SELinux events.